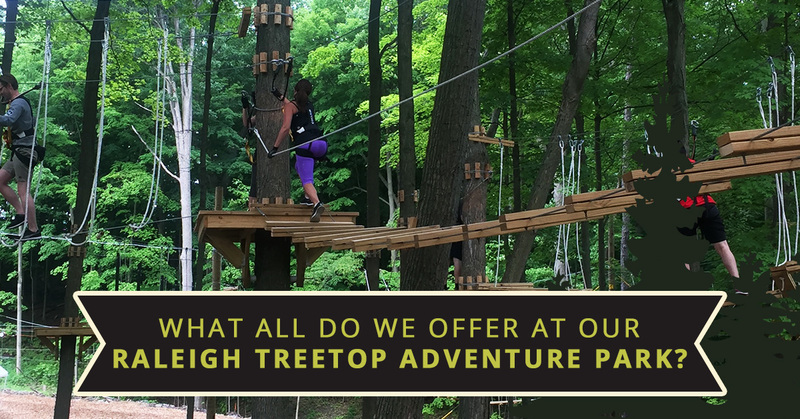 What All Do We Offer At Our Raleigh TreeTop Adventure Park? In recent posts we’ve written here at TreeRunner Raleigh Adventure Park, we’ve gotten the chance to highlight the health benefits of ziplining, explain why our treetop adventure park is the ultimate adult digital detox opportunity, and even how our Raleigh obstacle course is a great way to cultivate an adventurous spirit in your child! The great thing about TreeRunner Raleigh Adventure Park is that there is so much to talk and write about when it comes to the benefits both children and adults can experience when visiting our aerial adventure park. But at the end of the day, it’s all about having fun while getting out in nature and using our bodies. That’s why we’d like to take a step back and remind our readers about all that we offer here at Raleigh’s best treetop adventure park! Keep reading if you are interested in learning what kind of options we offer for birthday parties, corporate events, and much more! TreeRunner Raleigh Adventure Park: An Adventure Unlike Any Other! Let’s start big picture: TreeRunner Raleigh Adventure Park is the premier aerial adventure park in the entire Raleigh-Durham region. We offer well over 70 exciting obstacles and zip lines, three unique difficulty levels, and seven different courses. We even have a Junior Park for kids that are ages 4 to 7. You can find out more about our obstacle routes right here! 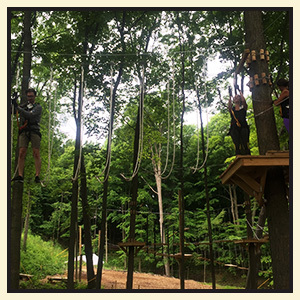 Between our aerial obstacle courses and an exhilarating set of zip lines, it’s an amazing chance to get up in the trees on your own, with friends, family, or coworkers! We are located on the David R. Kahn Jewish Community Campus in North Raleigh! We pride ourselves on our ability to smoothly host a wide variety of groups. Whether you are scheduling a field trip or a family reunion, the common denominator is that you better have group members who like to be outside and active! We are able to host events from 10 to 300 people! In fact, we often have reoccurring groups return annually, simply because it’s tough to beat an aerial adventure quite like this one! Whether you are planning a birthday party for yourself or a loved one, Treerunner Raleigh Adventure Park is a great place to spend your day. We offer both a Main Park Birthday Package and a Junior Park Birthday Package, both of which are explained in our dedicated resource linked above! When planning your group outing with us, it’s a good idea to allocate in the range of 3.5 hours of time at the park. For field trips, this usually means you are able to take at least half of the day to come see us! This will take care of a 30-45 minute facilitation after check-in, 2-2.5 hours of climbing, some meal/snack time, and getting everyone ready to go! Plus, we offer free bus parking on-site, with plenty of picnic tables available to make sure everyone has a great outdoor lunch among the trees. If you are looking for a unique way to show your staff how much you care, the corporate outing experience offered at Treerunner Raleigh Adventure Park is nothing short of spectacular. Your staff will leave refreshed — their morale boosted with a bit of team-bonding having been experienced as well! It’s a totally fresh way to take your office on a half-day or full-day retreat. Keep in mind we offer both Light Hearted Experience and the Classic Team Building Experience, with the former including a facilitator for the ground-portion of your time and the latter including a Facilitator for the entire experience! All of our facilitators have been through thorough training in order to ensure they have all the tools that are required to meet a wide variety of group needs and requests. Each group is different, so each group gets a totally custom experience! At the end of the day, we have a lot to offer groups and individuals of all ages. If you’ve been looking for a way to enjoy obstacle courses with varying degrees of difficulty — all while being suspended in the tree canopy — it’s time you try the aerial-adventure experience for yourself! We’ve got zip lines, barrels, bridges, cargo nets, and other obstacles — designed to challenge and entertain you all at once! It’s eco-friendly tourism and recreation at its finest. It’s a great way to have some family fun while getting a bit of exercise while you are at it! If you have any questions about our treetop adventure park in Raleigh, don’t hesitate to reach out to us or view our FAQ resource. Otherwise, it’s time to book your aerial adventure reservation today!